Did Michael Madigan and James Sullivan talk about pensions and unemployement? 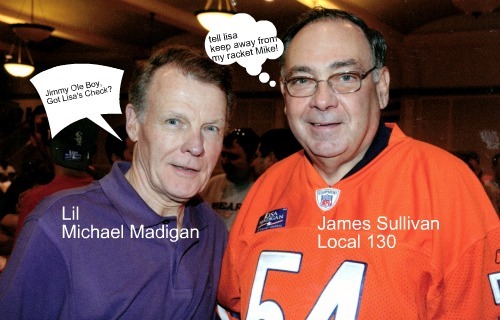 Many Local 130 Plumbers are out of work thanks to the wild good times by James Sullivan of Local 130 and Illinois House Speaker Michael Madigan. Local 130 goons are handing out Plumbing Licenses like candy! I wish Lisa Madigan would look into this racket. Plumbers in Illinois are losing their houses and starving to death. Please contact Patrick McDonough if you want more information. Plumbers Local 130 support Rahm for Mayor to continue the scams and rackets destroying Chicago. Lisa Madigan is Illinois’s States Attorney. Her family is a major problem. Not as greedy as Rod Blogo, but greedy. Just ask Rahm Emanuel about his residency. Previous PostPrevious 48Th Ward Candidates step forward at last, time to debate NOW! Next PostNext Any ideas on stopping the Plumbing License Fraud in Illinois and Chicago.